I bought these from Walmart a while back, and I found them in the crafts/beads section. Almost every time I see a jewelry organization post on a blog or on Pinterest (which according to my husband I have an unhealthy obsession with), it's about dainty jewelry perched on trees, earrings dangling off wires, or DIY involving things like radiator covers - I could go on and on. That's great for displaying jewelry, especially if it's in one of those pastel-walled rooms with lovely white furniture. Or for someone good at DIY-ing. None of which applies to me. 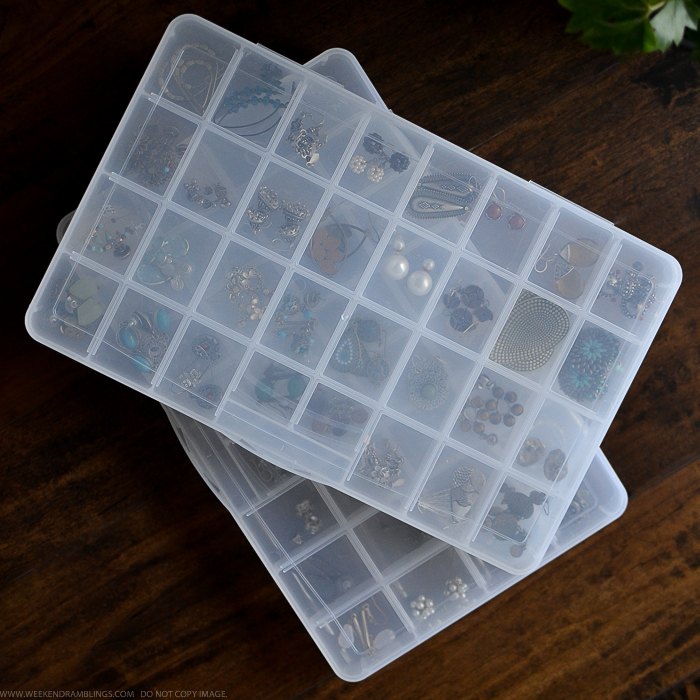 All I need is a sensible organization option that fits into my limited storage space, doesn't cost too much, and does a good job of keeping jewelry dust-free. If that seems like something you would like too, then these organizer boxes from Walmart (or Amazon) might be just what you need. I use these to store earrings, and the individual compartments are roomy enough to hold even some of my larger earrings. 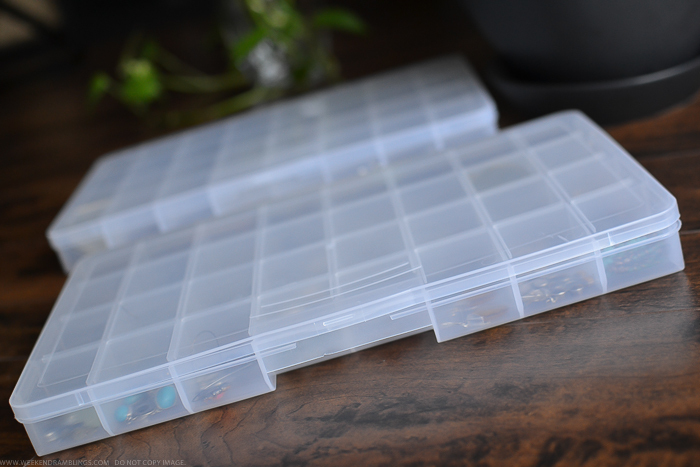 I also like the grooves on the lid that fit onto the dividers between compartments, so the earrings wont mix or move around too much even if the boxes weren't really kept flat. Plus it makes the boxes feel sturdier. Here's what I love about these boxes: I don't have to rummage through jewelry trying to find a matching pair. That saves time, but also, I hate it when jewelry tangles up and stones get scratched, etc, so this avoids all that. Every earring gets it's own little space, and I can easily see through the top of the box. I also have a lot of silver jewelry, and keeping them in a box keeps them from getting too tarnished. 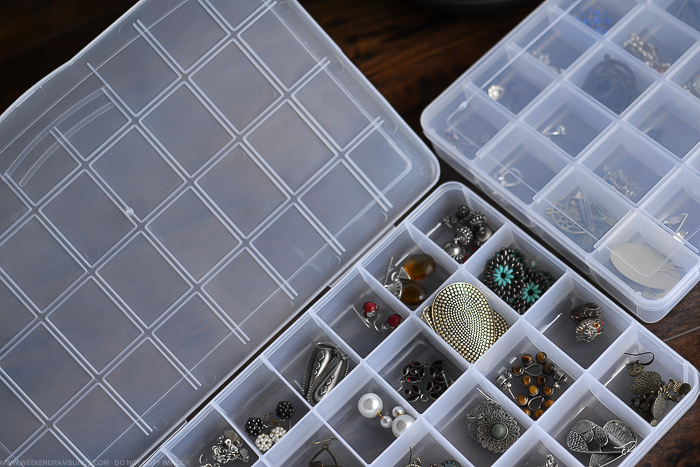 Earrings aren't exactly tiny beads, so the no-spill compartments might seem unnecessary, but I like knowing that I can throw these boxes any which way without any mix-ups. I picked up these boxes from Walmart where they seem to be on clearance for around $7. I saw them on Amazon, for about the same cost, so that's where I will be ordering more from (Walmart is a bit of a long drive). Links provided are for information only and are NOT affiliate links.